I love this time of year, long evening’s sitting out, the smell of BBQ’s, Wine/beer in hand, nibbles and dip at the ready. And when the sun is shining in Ireland, you couldn’t be any place better! 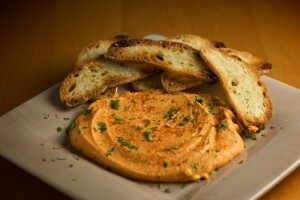 Tonight I’m going to make some Roast Red Pepper Hummus to go with our BBQ and Nibbles. This really is so simple and so tasty. It can be used so many ways, from Sandwiches, on a Burger, Dipped with Veggies, Dipped with Pitta Bread, And of course with some Veronica’s Snacks, The Sour Cream Herb & Onion one’s and the Roast Garlic and Mixed herb go especially well with this dip! Note: To easily roast a pepper you could just throw it on the BBQ to blacken up, then cover it in clingfilm for a few minutes and the skin will just peel off :)! Simple. OR you can just roast it in the oven. The Roasted Red peppers from the jar’s are just as good. In the bowl of a food processor, place the chickpeas and red bell pepper. On a cutting board, mash the garlic cloves with 1/4 teaspoon of salt to a smooth paste with the side of a knife, then add this to the processor along with the tahini, water, 4 tablespoons of the lemon juice, 2 tablespoons of the olive oil, cumin, and pepper and process until smooth, stopping to scrape down the sides as needed. Taste and adjust the seasoning by adding salt and additional lemon juice, if necessary, to taste. Transfer to a wide shallow bowl for serving and use the back of a serving spoon to form a well in the center of the hummus. Drizzle with the remaining olive oil and sprinkle the top with the parsley, and paprika (optional). Serve at room temperature, with Veronica’s Snacks for dipping (of course). Note: You can add a red chilli if you like a bit of heat :)! Also if your wondering- Mashing garlic w/salt is a very traditional middle eastern cooking technique; the reason why it is done is that the salt helps the garlic break down into a velvety paste so you don’t get stray chunks in your finished hummus, AND the salt also quickly ‘cures’ the raw garlic, taking the harsh, raw edge off it. 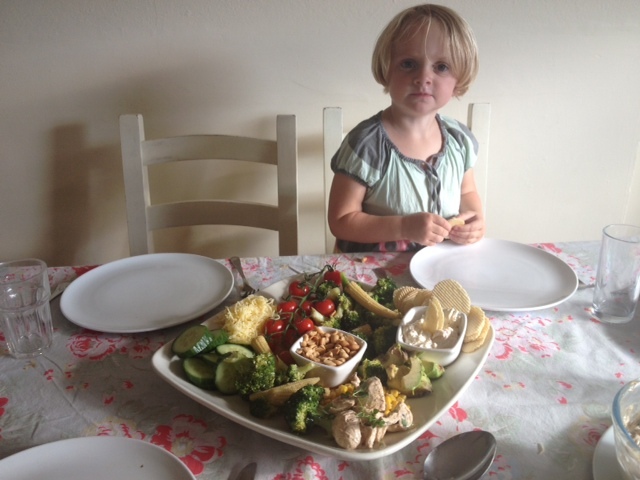 My Suzanne loves her Healthy Snacks- this was her last night mad to tuck in! 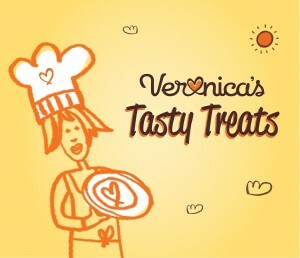 Thanks Veronica, will have to try that it sounds yummy.